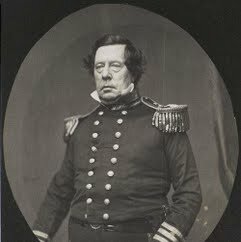 Matthew Calbraith Perry was a Commodore of the United States Navy and commanded a number of ships. He served in several wars, most notably in the Mexican–American War and the War of 1812. He played a leading role in the opening of Japan to the West with the Convention of Kanagawa in 1854. Perry was very concerned with the education of naval officers and helped develop an apprentice system that helped establish the curriculum at the United States Naval Academy. With the advent of the steam engine, he became a leading advocate of modernizing the US Navy and came to be considered The Father of the Steam Navy in the United States.